Qmee has been around since 2012, so it's not an entirely new opportunity. But the buzz surrounding it has increased over the last few years and I heard about it probably last year. It's been on my “to try” list for quite a while and I just recently got around to actually doing that. They have a strong social media presence and appear to be pretty responsive to the inquiries they get on Facebook. Qmee is a browser extension. You can install it on Chrome, Firefox, Safari, Internet Explorer, or Opera. Once it's installed, you may occasionally notice a little Qmee sidebar pop up when you do searches on Google, Amazon, Ebay, Yahoo, or Bing. You won't always see the Qmee sidebar expand, but when you do, that means money. Inside the sidebar are sponsored advertisements that should be relevant to whatever you just searched for. Each ad is worth a certain cash amount. Click the ad and that amount of money will go into your Qmee piggy bank. So if you typed in “cheap travel insurance” into Google or just about any other search engine and you had the Qmee extension installed, you would see the sidebar expand and you could earn a quick 7 cents just by clicking the ad Qmee showed you. Keep in mind there is no way to know which search terms will trigger Qmee to expand. Sometimes it expands, sometimes it doesn't. If you've been using it for days and you notice it never expands, you might want to double check that your Qmee extension is still enabled, or possibly uninstall and reinstall it (I had to do that today). Paypal is the only method of payment that Qmee uses. You can also choose to donate your Qmee earnings to a charity if you'd prefer. As mentioned above, there is no minimum amount for getting paid. What Is Qmee's Referral Program? Qmee does have a referral program, but it doesn't kick in until you've been using their app for a while (for me it took about a week and a half before I had any invites to share). 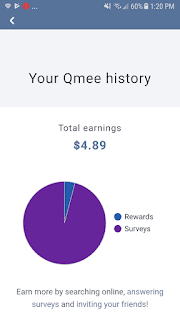 The way it works is that you will get $1 in your Qmee account whenever one of your referrals cashes out on Qmee for the first time. Note that you only get it the first timethey cash out — so a total of $1 per referral is possible. This post does contain my Qmee referral link. If you would prefer not to sign up via my link, feel free to bypass my link and just go straight to the Qmee site. As mentioned above, you won't get rich using Qmee. But you don't really have to do anything to earn money using it. If I search for something and Qmee decides to expand, I can click and get paid. If it doesn't, no big deal. The money will add up over time and I can cash it out whenever I see I have enough for a cash out to be worth it. Best Wishes and Happy Holidays!! !